It was the biggest launch in company history. But can Apple really be high-margin and high-growth at the same time? With Apple, it's easy to focus on the relative bad news. The stock is in a slump (although the company is still enormous). Cupertino hasn't created a "new" product category in years (although its existing products are sensational). The world's leading market-maker for consumer technology looks more like a defensive tweaker (although the tweaks are often inspired). Last week's launch was most celebrated for the cheaper, colorful iPhones, but "analysts and supply-chain watchers are saying the [higher-margin] 5S won the weekend far and away," Sam Grobart reports. That's not so surprising. Apple has been keeping old, cheaper versions of its phones on the market for many years alongside new models, and the new models have always outsold the old. Apple devotees aren't buying iPhones to save money. They just want the world's best phone, and they think Apple makes it. Bigger base. Lower growth. It's basically the company's conundrum in a nutshell. Apple can stay high-margin -- by selling more gold-plated phones. 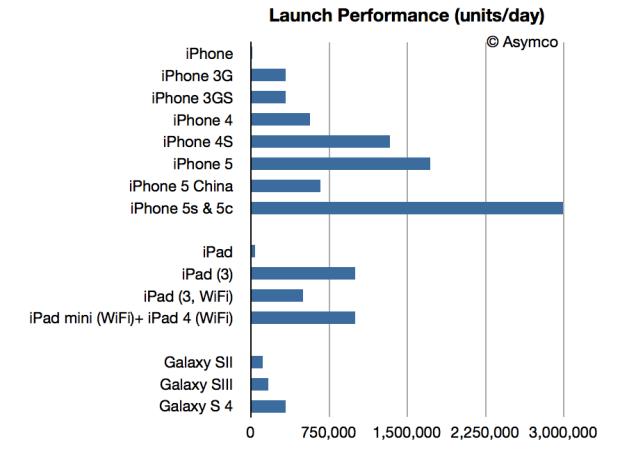 Apple can become super-high-growth -- by volume, at least, by offering cheaper products affordable at the Chindia price. It probably can't be both.